Update: Thanks to the ever-knowledgeable and observant Midcentury Modernist, I realize that I never did note who the architect of the apartment was. George Bemi, who had a long and prolific career in Ottawa designed this midcentury beauty for Robert Campeau. Shortly following its completion, he went on to design the Sampan Tavern Restaurant on Carling. Given this update, it’s back to the top! I originally wrote this in April 2013. In very much the same way as they are today, the growing pains brought on by rapid growth and development were apparent in Ottawa during the decades following the Second World War. The case of Robert Campeau’s Champlain Towers at 200 Rideau Terrace in Lindenlea provides an excellent example. Between infrastructure that was not prepared for growth, a neighbourhood that was uncomfortable with intensification, legal delays, labour unrest, and, perhaps most visibly, the legendary feud between Mayor Charlotte Whitton and Robert Campeau, its little wonder that it was ever completed. Fresh from the construction of their first tower apartment (Colonel By Towers, at Bronson and Holmwood),1Babad, Michael and Catherine Mulroney (1989). Campeau: The Building of an Empire. Toronto: Doubleday Canada, p. 60. and an already well-established builder in Ottawa, the Campeau Corporation received a permit on July 31, 1959 to erect an 11-storey apartment building on Rideau Terrace was issued. Wasting no time, the company had excavated the lot in preparation for construction by December. Sensing the opportunity to construct a larger building, the company filed for a new amended permit to construct a 12 storey building with hefty increase in the number of units. City staff pointed out that – as had become increasingly common in the face of high rise development – the combined storm and sanitary sewer running under Putman Avenue did not have the available capacity.2Best, Patrick (1960). “Sewers Delay Campeau Permit.” Ottawa Citizen. June 8, 1960, p. 3. Perhaps emboldened by his previous battles with then former mayor Charlotte Whitton or a stroke of the sort of brash hubris that he was known for, Campeau reacted to the (illegal) revocation3“Apartment Permit Revoked.” Ottawa Citizen. June 22, 1960, p. 7. of his building permit by declaring that he would press on, saying that “if the city wants to stop me now it will have to pay a lot of money for compensation.”4Best, Patrick and Paul M. Dunn (1960). “Campeau Defies City Council.” Ottawa Citizen. June 20, 1960, p. 7. With that line drawn in the sand, the city was faced with construction that was sure to overwhelm the existing sewage infrastructure, which was already struggling to contain the results of growth in Ottawa and Eastview (Vanier)5Ibid.. The situation only escalated from the city’s attempt to cancel the building permit. On June 22, 1960 (the evening following the permit’s cancellation), both Charlotte Whitton and Controller Sam Berger showed up at the site and it was alleged that they “interfered” with the proceedings. In response, Campeau launched a damage suit against the two and mulled having a writ issued against them. In response, Berger suggested that “[if] Mr. Campeau want to sue me for trespassing he is welcome to do so,” adding that “I am not going to be frightened by Mr. Campeau… I am upholding the interests of the residents and if I can help them I will do so.”6Best, Patrick (1960). “Whitton ‘Scene’ At Campeau Site Draws Legal Suit.” Ottawa Citizen. June 23, 1960, p. 1. Two days following, the Deputy City Solicitor affirmed that the revocation was indeed not legal and that, if city council was indeed opposed to the development on health grounds (re: the sewage overload) that they may be able to consult the Ottawa Board of Health.7Best, Patrick (1960). “Building Permit Legal.” Ottawa Citizen. June 25, 1960, p. 1. Never one to go quietly, Whitton made good use of her On Thinking it Over column in the Ottawa Citizen suggesting that Campeau was manipulating Council to his own ends8Whitton, Charlotte (1960). “In Council Directing Or Directed?” Ottawa Citizen. June 29, 1960, p. 3. and later, painting a picture of him as a corrupt and seedy insider who has co-opted the Board of Control using in camera meetings to keep it quiet.9Whitton, Charlotte (1960). “In Camera Or Cahoots?” Ottawa Citizen. August 15, 1960, p. 3. In the meantime, development continued in the Rideau Terrace area – with considerably less controversy – when a Montreal-area developer was given the go-ahead10Best, Patrick (1960). “City Inspector Gives Okay For Apartment.” Ottawa Citizen. October 5, 1960, p. 57. to construct a 12-storey apartment11Best, Patrick (1960). “Apartment Gets Okay From City Inspector.” Ottawa Citizen. October 7, 1960, p. 2. building on the southwest corner of Springfield and Rideau Terrace. In the meantime, commensurate with the temperature, Campeau’s plans for what was still a hole in the ground at 200 Rideau Terrace had risen to 17 storeys from the original 11. It appears that the delay gave nearby residents the time to coordinate their efforts and collectively oppose Campeau’s desire to see his project grow any more than it already had. Also helpful to their cause was the re-election of Charlotte Whitton as Mayor. 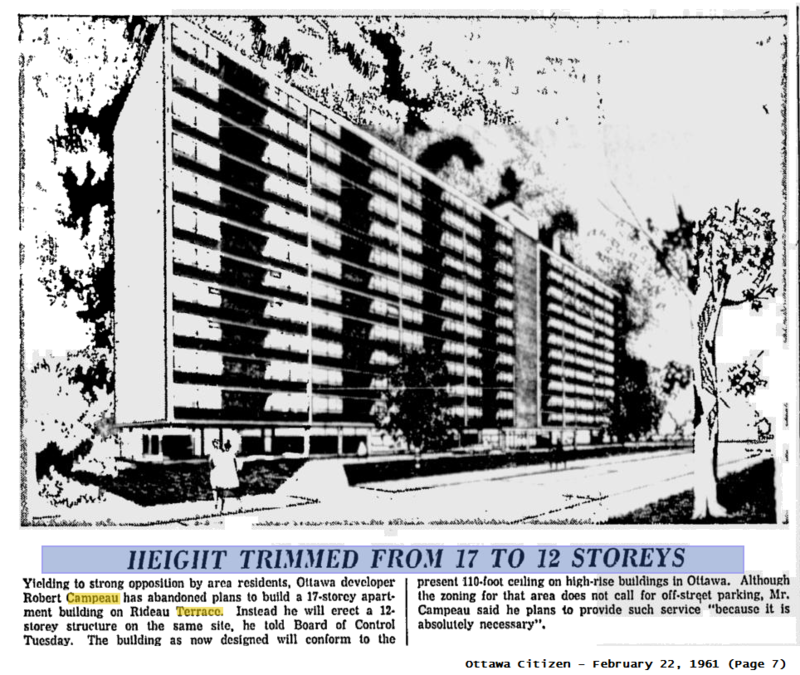 On February 22, 1961, the Citizen reported that “[c]onfronted with outright opposition to ‘piercing’ the present 110-foot ceiling on high-rise buildings, Mr. Campeau gracefully abandoned his plans for a 17-storey apartment on the Rideau Terrace site.”12Wilson, Phyllis and W.H. Arnott (1961). “Campeau Settles On 12 Storeys.” Ottawa Citizen. February 22, 1961, p. 1. Additionally, Campeau knew that if he were to continue to fight, he would not be able to begin construction by March 1 and miss his Spring 1962 opening.13Ibid. In order to expedite the construction process, a new tower crane was imported from Europe which was noted to cut days off the construction schedule. “Chateau Charlot”: Whitton and Campeau continue to exchange barbs. Never missing out on an opportunity to enlarge his vision for the contentious Rideau Terrace site, Campeau applied to the Federal Works Department for a $100,000 grant to construct a communal fallout shelter in the basement of the apartment. He was turned down on the basis that the program was intended to fund home-based shelters.14“Campeau Bid Rejected.” Ottawa Citizen. November 21, 1961, p. 1. With the project well under way, it appeared that the ducks were finally lined up and the Spring 1962 opening would be a reality. Campeau, however, was not finished fighting. This time, it was not with the mayor, but rather with the Wood, Wire and Metal Lathers Union and the Plasterers and Cement Masons Union. Beginning in November15“Picket Lines At Apt. Jobs Are Orderly.” Ottawa Citizen. November 28, 1961, p. 19., both unions picketed the Champlain site to protest one of the subcontractors’ use of non-union labour.16Babad & Mulroney (1989), p. 66. Although he was not particularly fond on unions or unionism for that matter, Campeau did recognize them as a fact of doing business and the pickets were generally peaceful.17Ibid. That changed on the morning of January 8, 1962, when a number of the picketers blocked Campeau’s access to the Champlain site and words were exchanged. Following the incident, an injunction was secured and later extended against the unions with the judge reiterating that only peaceful picketing would be permitted.18“Injunction Continued Against Campeau Pickets.” Ottawa Citizen. January 17, 1962, p. 42. Advertisement for the new penthouses. In spite of all the excitement and acrimony, the Champlain Towers were officially opened in 1962. Determined to ensure that the apartments would attract a “good crowd” – and perhaps also in response to Whitton’s claim that there were “grave concerns” that “Government House will become the back yard of a row of apartment houses”19Wilson, Phyllis and W.H. Arnott (1961). “Campeau Settles On 12 Storeys.” Ottawa Citizen. February 22, 1961, p. 1. – Campeau sought and won Council’s approval for a two-storey penthouse addition to the recently-completed building.20“Campeau gets go-ahead for penthouse addition.” Ottawa Citizen. July 15, 1963, p. 3. The gambit appears to have been a success, as the property was noted to have been adopted as the home of “politicians, diplomats, judges, and other leading figures.”21Babad & Mulroney (1989), p. 100-1. By the end of the 1963, the company began running advertisements in the Citizen, describing the penthouses as “sumptuous”, “magnificent”, and “distinguished”.22Campeau Construction (1963). “Champlain Towers – Sumptuous Penthouse Suites.” (Advertisement). Ottawa Citizen. December 14, 1963, p. 34. The rapid pace of development around Rideau Terrace proved to be quite enough for residents and Council alike. Neighbourhood opposition mixed with Campeau’s very public maneuvers to see the project through showed the limitations in the City of Ottawa’s zoning bylaw and planning process. To this end, the city commenced work on a new city-wide zoning by-law, which was predictably met with opposition from the city’s developers.23Arnott, W.M. (1964). “City seeks extension of zoning bylaw.” Ottawa Citizen. February 19, 1964. The incapacity of the Putman sewer also had to be dealt with. As noted above, high-rise construction placed a significant burden on a water and sewer infrastructure that was not designed with that level of density in mind and it was quickly found lacking in the face of it. The City was, therefore, forced to search for new sources of revenue that would be considered fair and equitable in increasing the capacity of the system. To this end, the city passed By-Law 449-62 under Section 4 of the City of Ottawa Act on December 17, 1962 which levied a tax of $125 per dwelling on high-rise residential construction, to be applied retroactive to May 2, 1960. The revenues raised under this scheme were to be dedicated to the expansion of the storm and sanitary sewer and water systems.24City of Ottawa v. Royal Trust Co.  SCR 526, pp.526-7. Upon the passage of the By-Law, a number of developers including the Royal Trust Company, Kenson Construction, Freedman Realty, Pinecrest Investments, Rideau Terrace Ltd., and Shirden Investments filed suit with the Ontario Superior Court, claiming that the By-Law was not only outside of the city’s powers, but it was also discriminatory.25Ibid. The group of developers failed in this petition, but were successful in having the By-Law quashed at the Ontario Court of Appeal. In front of the Supreme Court of Canada, the developers found – in an 8-1 decision – the Court supported the By-Law and noted that it was quite reasonable and legal.26Ibid. The retroactive payments owed to the city were said to be worth approximately $2,000,000 (approximately $15,000,000 today) and worth $400,000 annually. Furthermore, the decision allowed the city to avoid charging “an emergency one-mill tax boost” to cover the costs.27“Supreme Court upholds Ottawa’s high-rise tax.” Ottawa Citizen. May 11, 1964, pp. 1 and 3. Given Whitton’s public explosion in the previous summer during the grand opening of the new storm sewer along Putman (financed in majority by the City of Eastview),28“Both dynamite, mayor explode at ceremony.” Ottawa Citizen. June 13, 1963, p. 5. the decision was clearly something to celebrate. In the end, Campeau got his tower (although at 5 stories less than he had mused) and the City had won the ability to levy development charges based on building class – something very necessary to managing the rapid pace of population growth and construction. The communities surrounding the site at Rideau Terrace would have to wait until the next project – at the Craig and Son property – for their position on development in the area to be acknowledged. In spite of such a colourful and eventful construction history, Campeau did not hold on to the property for a long time. A mere twenty years later, he sold his share to Vishbon Investments (aka Lithwick Brothers) as part of a greater project to divest the Campeau Corporation from “unproductive” residential holdings and focus on commercial properties, such as the Pinecrest Mall.29Campbell, Cathy (1983). “Campeau Corp. sells its interest in prestigious apartment building.” Ottawa Citizen. July 21, 1983, p. 49. It looms over the neighbourhood today. 1. ↥ Babad, Michael and Catherine Mulroney (1989). Campeau: The Building of an Empire. Toronto: Doubleday Canada, p. 60. 2. ↥ Best, Patrick (1960). “Sewers Delay Campeau Permit.” Ottawa Citizen. June 8, 1960, p. 3. 3. ↥ “Apartment Permit Revoked.” Ottawa Citizen. June 22, 1960, p. 7. 4. ↥ Best, Patrick and Paul M. Dunn (1960). “Campeau Defies City Council.” Ottawa Citizen. June 20, 1960, p. 7. 6. ↥ Best, Patrick (1960). “Whitton ‘Scene’ At Campeau Site Draws Legal Suit.” Ottawa Citizen. June 23, 1960, p. 1. 7. ↥ Best, Patrick (1960). “Building Permit Legal.” Ottawa Citizen. June 25, 1960, p. 1. 8. ↥ Whitton, Charlotte (1960). “In Council Directing Or Directed?” Ottawa Citizen. June 29, 1960, p. 3. 9. ↥ Whitton, Charlotte (1960). “In Camera Or Cahoots?” Ottawa Citizen. August 15, 1960, p. 3. 10. ↥ Best, Patrick (1960). “City Inspector Gives Okay For Apartment.” Ottawa Citizen. October 5, 1960, p. 57. 11. ↥ Best, Patrick (1960). “Apartment Gets Okay From City Inspector.” Ottawa Citizen. October 7, 1960, p. 2. 12. ↥ Wilson, Phyllis and W.H. Arnott (1961). “Campeau Settles On 12 Storeys.” Ottawa Citizen. February 22, 1961, p. 1. 14. ↥ “Campeau Bid Rejected.” Ottawa Citizen. November 21, 1961, p. 1. 15. ↥ “Picket Lines At Apt. Jobs Are Orderly.” Ottawa Citizen. November 28, 1961, p. 19. 16. ↥ Babad & Mulroney (1989), p. 66. 18. ↥ “Injunction Continued Against Campeau Pickets.” Ottawa Citizen. January 17, 1962, p. 42. 19. ↥ Wilson, Phyllis and W.H. Arnott (1961). “Campeau Settles On 12 Storeys.” Ottawa Citizen. February 22, 1961, p. 1. 20. ↥ “Campeau gets go-ahead for penthouse addition.” Ottawa Citizen. July 15, 1963, p. 3. 21. ↥ Babad & Mulroney (1989), p. 100-1. 22. ↥ Campeau Construction (1963). “Champlain Towers – Sumptuous Penthouse Suites.” (Advertisement). Ottawa Citizen. December 14, 1963, p. 34. 23. ↥ Arnott, W.M. (1964). “City seeks extension of zoning bylaw.” Ottawa Citizen. February 19, 1964. 24. ↥ City of Ottawa v. Royal Trust Co.  SCR 526, pp.526-7. 27. ↥ “Supreme Court upholds Ottawa’s high-rise tax.” Ottawa Citizen. May 11, 1964, pp. 1 and 3. 28. ↥ “Both dynamite, mayor explode at ceremony.” Ottawa Citizen. June 13, 1963, p. 5. 29. ↥ Campbell, Cathy (1983). “Campeau Corp. sells its interest in prestigious apartment building.” Ottawa Citizen. July 21, 1983, p. 49.